IEP students are here to study English but there are many wonderful outdoor activities that you can do during your study abroad. This level 4 student took a hike. Let’s find out how the hiking was like! Are you interested in hiking? Trails in Hawaii are typical for some new adventure. There are many choices, when you can go. If you are interested in trails there exists an app which is based on all trails in Hawaii. Although I haven’t done many trails before, I can recommend to you Puʻu ʻŌʻō Trail. You can find this trail on the way to Kona in the middle of Saddle Road. This trail has two parts, and you can decide which part you would like to go on. 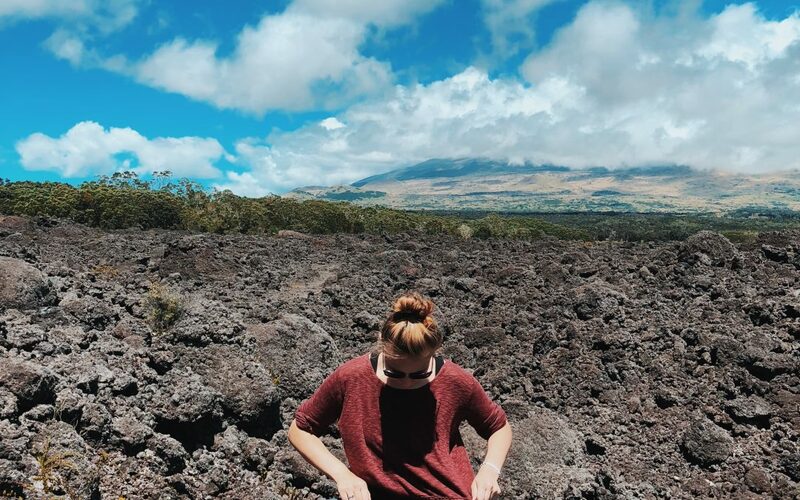 You can even come to Puʻu ʻŌʻō Volcano, but that’s not possible in one day because it’s too far away. It’s so beautiful because of the diversity of nature. In one moment, you go through lava fields and another moment you go through the fresh green forest. It’s so amazing. The sun was shining really hard, and we hadn’t sunscreen, so we were sunburned. It was really painful. Otherwise it was a beautiful experience. This place is peaceful and enjoyable with no people. I can recommend this trail to everyone, it is worth it.